Thermography vs. Mammography for Early Breast Cancer Detection: Who Benefits Most? There is a turf war between those who favor thermography and those who favor mammography for early breast cancer detection. The mammogram party is supported by federal health agencies and non-governmental organizations (NGOs) as well as the mammogram industry. For the most part, the under-supported thermography advocates are outgunned and outnumbered by the mammogram crowd, which has declared a soft, at least for now, war on thermography to restrict or deny its independent breast cancer screening use. Let’s take an objective look at these two sides while learning of the extent thermograms can be used by medical practitioners. So the fear motive of protecting against breast cancer with early detection is easy to understand. And it is used constantly by all government and non-government cancer groups to promote frequent mammograms for women from age 40 and up. It’s considered a standard of care. Many insurance plans will pay for mammograms fully or with very low co-payments. But there has been growing evidence of harm from mammograms that includes increased over-diagnosis resulting in a significant amount of treatments that were never necessary. Until 2002, the cancer industry’s standard of care for detecting or “screening” for breast cancer required annual mammograms. All the cancer foundations, organizations, and fundraising groups became cheerleaders for annual mammograms for women aged 40 or 45 and up. However, from around 2002 and on, data analyzed by non-participants of the breast cancer early detection turf war between mammography and thermography were beginning to erode confidence in the benefit to harm ratio of early screening with mammograms. Radiation by any means is carcinogenic, and the low energy X-rays used by mammograms are four times more carcinogenic than other types of X-ray machines. Screening led to 30% overdiagnosis and overtreatment, or an absolute risk increase of 0.5%. This means that for every 2000 women invited for screening throughout 10 years, one will have her life prolonged and 10 healthy women, who would not have been diagnosed if there had not been screening, will be treated unnecessarily. So after 2002 to now, the U.S. Preventive Services Task Force (USPSTF), American Cancer Society (ACS) and other groups began changing their recommendations for breast cancer screening from annual to every two years (bi-annual) for women 50 and older. In other words, they eased up on mammograms out of necessity. 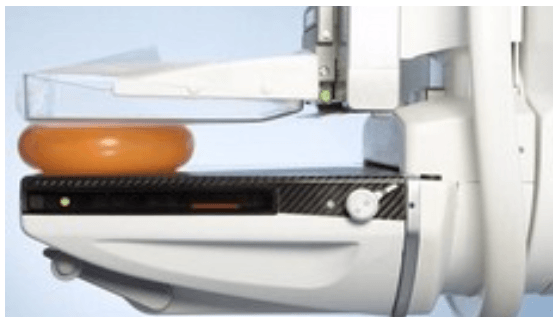 Of less concern, but speculated as potentially harmful, are the 50 pounds of pressure squeezing the breasts by the mammogram machine’s two X-ray radiating plates. The potential for breaking up a cancer cell colony or tumor with that squeezing pressure, causing cancerous particles to spread had also become a concern with some. After all, there is a history of invasive tumor probes causing metastasis or spreading cancer to other areas of the body. Perhaps even worse is the fact that detecting tumors is too late for prevention. It takes up to eight years for cancer cells to colonize and produced tumors in breasts. But that’s enough time for orthodox oncologists to scare women into undergoing expensive and toxic treatments while discouraging them from natural remedies. Thermography offers the ability to detect inflammation and suspicious blood vessel activities that point to disease and dysfunction without radiation. It does so by producing 3D color imaging produced from the body’s internal variations of heat in the body. In other words, instead of sending radio waves into the body to get a picture of what’s going on inside the body, a special extremely sensitive infrared ray camera that does not come into contact with the body “takes a picture” of the infrared energies emanating from the body’s temperature variations. The thermal radiation’s computer takes the slight thermal variations and creates visual color representations that appear on the machinery’s screen. Those images are then copied for further scrutiny. And it is able to detect abnormalities that can lead to a disease before the first signs of cancer tumors show up. This allows women to take advantage of lifestyle and dietary changes before cancer tumors appear and avoid chemotherapy, radiation therapies, and mastectomies. The focus of the mammogram vs thermogram turf war centers on breast cancer. But techniques with thermograms are able to spot markers that are precursors to other cancers and allow natural preventative measures that mainstream oncologists are not trained for and/or don’t want to be. But not all medical insurance providers will shell out the $200 or less for a breast thermogram. Mammograms cost only slightly less and are uniformly covered by both private and government medical insurers. Avoiding mainstream oncology’s highly profitable options for treatment may be a major reason why mainstream oncologists constantly assert that thermography cannot detect tumors and is not a bonafide early detection device. It hampers radiologists’ revenue as well. 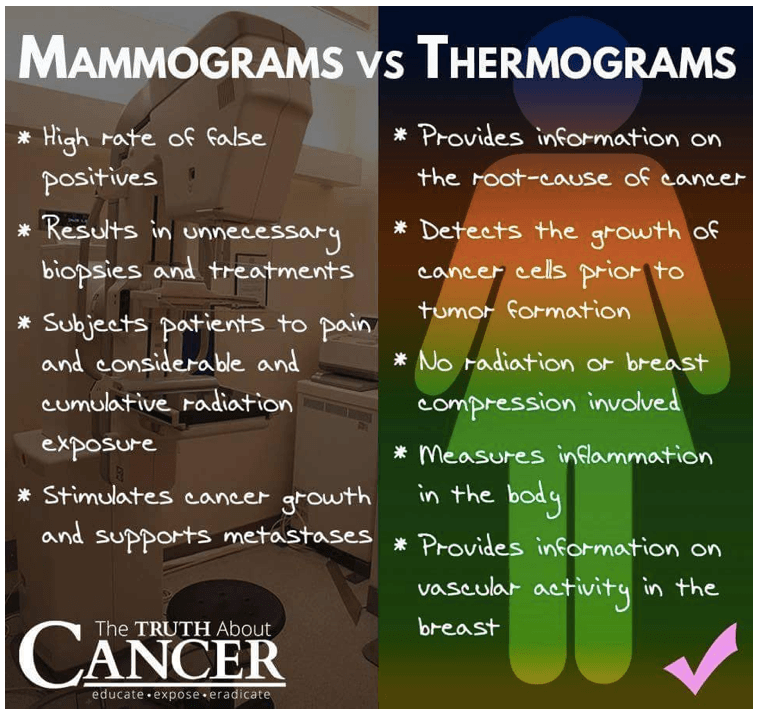 Although the FDA has approved mammogram machinery and technology, even as an adjunct to mammograms, both the CDC and FDA agree with the same assertions as oncologists that thermograms are not valid substitutes for mammograms with breast cancer screening. Instead of undergoing chemotherapy or surgery unnecessarily, better diet and supplement choices could easily keep those lesions from becoming cancerous. Breast cancer cells take around five to eight years to develop enough for mammogram tumor detection. Just in time for costly, profitable treatments. But because of thermography’s extreme sensitivity to infrared emissions from slight temperature variations, its images render the earliest signs of breast cancer and/or a pre-cancerous state of the breast. This allows plenty of time to adjust one’s diet and lifestyle to strengthen the immune system and not be subjected to the coercion and intimidation used by mainstream oncology to force women into chemo or radiation or surgery or mastectomy without a second opinion on treatments. Mammography is not an acceptable way of screening breasts; the only reason it’s tolerated is that it is a major source of steady income for radiologists. They have come to covet mammography and want no competition from other approaches. The myopic perspective of the breast cancer screening technology turf war inhibits the bigger picture of what thermograms provide for other precancerous conditions throughout the body as well as determining gastrointestinal imbalances or inflammatory conditions. Thermography imaging eliminates X-rays, so the brain is spared from radiation while allowing better early detection of inflammatory dental conditions before infections occur or for analyzing pathways for dental surgeries. Over the years at our clinic, we have imaged thousands of women using infrared thermography. In many cases, we have clearly seen cases of inflammation in the dental area using this heat-sensing technology. Many of these cases are caused by a low- grade infection and inflammation and have, through further testing, been attributed to dental or oral issues, such as issues related to root-canal-treated teeth. Thermography is also highly useful for detecting various dysfunctions and precancerous conditions of the head and neck region, including early thyroid cancer detection while avoiding radiation hazards to the brain. The unique significance of thermography is it is both a qualitative and quantitative assessment, which can result in pre-emptive early preventative measures as well as monitoring progression or regression of underlying causes of several diseases in a systematic manner. If you don’t have access to a clinic or doctor that uses thermography, you can access this national list of thermography centers.